Norwegian Breakaway offers a host of dining experiences. Not only do you have such popular signature Norwegian Cruise Line specialty restaurants as Le Bistro (French fine dining) and Cagney's Steakhouse but you have noted Chef Geoffrey Zakarian's Ocean Blue, one of the most impressive specialty restaurants at sea. There is also the Brazilian churrascaria, the Italian restaurant, the Japanese steakhouse, the sushi bar and the Asian noodle bar. Breakaway has a very strong line-up of specialty restaurants. However, you do not have to go to one of the specialty restaurants to have a memorable dining experience. The Manhattan Room, one of the three main dining rooms, offers an experience that is beyond that of most cruise ship main dining rooms. The room itself is interesting. Located at the stern of the ship on Deck 7, the Manhattan Room is a large space. Indeed, the center section over the large dance floor is two decks high. Natural light pours in during daylight hours from the large windows at the stern and from a series of windows on each side of the room. The décor was inspired by the Art Deco style that flourished in New York City during the first half of the 20th century. It is a style that you often see in the movies of the 1930s and 40s in which part of the action takes place in a glamorous supper club. Bolstering the supper club image is a bandstand at the aft end of the dance floor. During dinner a small band with a singer perform and guests do get up to dance. Still, the music was not so loud that you cannot have a conversation. On consecutive evenings, we sat at two different locations both near the dance floor and had no difficulty conversing. On certain evenings, dancers from the Broadway show Burn the Floor take over the Manhattan Room dance floor and give a performance during dinner. There is no extra charge for this entertainment. Because of these attractions, the Manhattan Room is more popular than the ship's other two main dining rooms. Taste and Savor are smaller venues on each side of Deck 6 and while they are pleasant contemporary-style rooms, there is nothing special about them. As a result, there is often a wait to get into the Manhattan Room. Except for large parties, the Manhattan Room usually does not take reservations. Consequently, when you arrive at the restaurant, you first have to stand on line to see a receptionist at the entrance to the restaurant who estimates how long it will be before a table will be ready. If this estimate does not discourage you enough to go somewhere else, you are given a pager which will alert you when a table is ready. Previously, on other Norwegian ships, a guest who was given a pager by one of the main dining rooms would receive a discount on drinks at one of the bars while he or she waited. This practice is not followed on Breakaway. When your pager buzzes, you walk past the line that is waiting to receive pagers to another receptionist who stands further down the corridor that leads to the seating area. A few other parties are often standing in line here and there is usually a short wait as the receptionist determines which table goes to which party. Once seated, the service was prompt and friendly each time we dined in the Manhattan Room. When we were on Norwegian Breakaway before, the Manhattan Room was not open for breakfast or lunch. On this cruise it was. Since, as discussed earlier, the Manhattan Room is a more interesting space than the other main dining rooms, this is a welcome change. 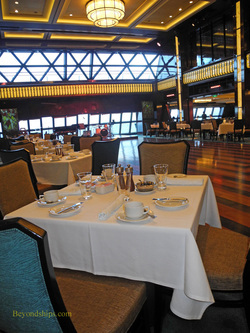 On most cruise ships serving the North American market, the ship's buffet restaurant is the most popular breakfast venue. As a result, breakfast in the main dining room is usually uncrowded although there are always enough guests who prefer to be served breakfast so that the room is not empty. On Breakaway, there was no line to get into the Manhattan Room for breakfast but there were enough guests to populate the tables on the starboard side of the room near the entrance. The breakfast menu offered a good assortment of breakfast favorites ranging from fruit, cereals and yogurt to eggs cooked to order and griddle items. The scrambled eggs were a pleasant surprise. All too often scrambled eggs are mass produced and left to suffer under heat lamps. These were fluffy and tasted freshly made. The thick French Toast was also soft and fresh tasting, not at all rubbery. However, the artificial maple syrup had a lingering aftertaste that prevented this dish from being outstanding. For lunch, the menu offered both large meals and lighter fare. The Greek salad starter was refreshing with fresh lettuce, bits of tomato, olives and slices of feta cheese. A salmon fillet was nicely done and not at all fishy. The Philly Cheese Steak was tasty. At dinner, the Manhattan Room offers multi-course meals. As is the practice in most cruise ship main dining rooms, you can have as many items as you like. Indeed, some guests make it a point to have two entrees. The menu is divided into items that are available each night and items that change each night. In addition to the items listed on the menu, the Manhattan Room has a different special entree each evening that is not listed on the menu. Of the entrees, we were most impressed by the Italian-inspired items. The first evening was a very good eggplant parmigana but on the second evening the special entree was a beef lasagna that almost demanded a second helping. Along the same lines, the cherries jubilee dessert warranted a second order. We enjoyed the Manhattan Room on each occasion. If you are looking for a serious gourmet dining experience, Ocean Blue or Le Bistro are the places to go. But, do not assume the food in the Manhattan Room is banquet food. It is well above that. Furthermore, the interesting décor and the live music at dinner made the experience stand out beyond the ordinary.